To start the new year, we are going to start with posting hardware reviews as well, next to other tutorials that might be of use to you guys. We got the opportunity to test for you guys the Plantronics RIG 400HX. This lightweight headset, especially designed for the Xbox one, is praised on the website of Plantronics as “Lightweight”, “Comfortable” and “Noise-Canceling”. With it’s 203 grams, compared to other headsets of comparable quality, this feels lighter, but objectively it isn’t. It isn’t a heavyweight headset. Comfortable, this is the trademark of this headset. When you take it out of the box, you will notice that he is covered with cussions, at the ears, where there are normally cussions, but also on the headband, which makes this headset very comfortable to wear for longer gaming sessions. He covers your whole ear, which helps by not letting you lose any sounds, and makes that enviroment noise is cancelled. A plus is also that, thanks to the 3.5 mm jack, you can use it with other devices like an Ipad or Ipod if you would like. The mic also surpresses enviroment sound, whereby he only registers your voice. Music through this headset sounds amazing and you get a complete soundexperience, even the bass. The sound from all games is very, very pure and you hear the slightest sound, whereby you notice faster from where the enemy is going to come in a shooter, which gives you a better experience of the game. Because this headset supports Dolby Atmos, is it possible to play games (like Assassin’s Creed: Origins) with this extra experience, whereby you hear the full 360 range of sounds. The list of compatible games for Dolby Atmos, is still small, because it’s still a relatively new technology, but the list is expected to grow in the future. Here is a link if you want to see the list. It is a member of the RIG family of plantronics, which means that it is highly customizable to your own taste. You can change the look and feel of your headset with componants of the headset. You can change the wiring and the plastic parts until you have a headset that is completely yours, which makes the gaming experience so much more unique and creative. For the price of approx. 50 euro, it has a very good buildquality and especially the sound is what makes it stand out against competitors. 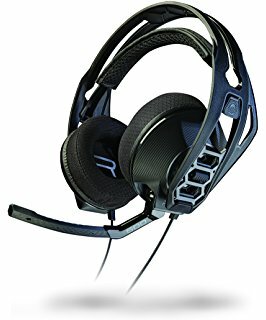 This makes a good choice for a first headset for budget gamers, as you will have years of pleasure out of this buy. I recommend it highly. Qua comfort it is much better than others in the same price range. The earmuffs are comfortable and are good to keep the gaming sounds directed at your ear and the enviroment sounds out of it, so you can get completely immersed in your gaming. Sound is of a high quality with this headset. The only thing that I didn’t like about this headset is that the 3.5 mm jack is curved, so if you plug it into your controller, and it moves a little, it will start disturbing, but this is only a minor nusance of an otherwise awesome headset. If you would like to buy one, you can click my affiliate link here. soldering: what do you need?